Painting of Mahatma Gandhi, c. 1925. Painting of Mahatma Gandhi (from back) sitting in meditative pose on the banks of river Sabarmati, c. 1925. Painting of Mahatma Gandhi with Gautama Buddha as his shadow, c. 1928. Painting of Mahatma Gandhi sitting with his associates outside at night, c. 1928. Painting of Mahatma Gandhi getting his meal served by Mirabehn, c. 1928. Painting of Mahatma Gandhi during the Salt March, March 1930. Painting by Krishnalal Bhatt of Mahatma Gandhi walking (from back), March 1930. Painting by Vinayak S. Masoji of Mahatma Gandhi’s midnight arrest at Karadi camp, 4 May 1930. Painting of Kasturba Gandhi, c. 1930. 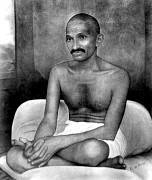 Painting of Mahatma Gandhi, c. 1930. Painting of Mahatma Gandhi and Gautama Buddha, c. 1930. Painting of Mahatma Gandhi on the spinning-wheel incorporating the globe. Print of a painting of Mahatma Gandhi showing him at Dandi, 4 May 1930. Painting by N.V. Virkar of Mahatma Gandhi,1931.